Is Talk of a Multi-Nation Trade Battle Cooling Off, Or Just Toning Down? News reports focusing on the simmering debate over U.S. tariffs and trade policies have centered largely on relations with the U.S.’s largest trading partner — The Peoples Republic of China and its free trade port of Hong Kong, gateway to the country’s interior. However, this dissension has also spilled over in discussions about trade agreements involving other major importers of U.S. goods, such as Canada and Mexico. While some see this posturing as just a prelude to formal discussions – that will produce softer positions later — others share a growing fear that this battle could escalate and spread globally to involve U.S. trade deals with the European Union, South Korea, Japan, India, United Arab Emirates, Turkey and Vietnam in ways that could adversely affect California’s agriculture community. The current controversy began with the Trump administration’s plan for overhauling U.S. trade policy through stiffer tariffs on imported steel and aluminum. Economists warn if this turmoil spirals out of control, it could evolve into an ugly worldwide trade war encompassing a variety of product categories. Pozzi said he remembers hearing reports stating that the Trump Administration is showing signs of backing down on trade threats, but commented that agriculture often gets hit because it is an easy target, and because any possibility of a disruption in supply and demand cycle from the world’s food sources can be used as a weapon. While recent rhetoric from the White House has cooled — somewhat — about the unfairness of existing trade deals, such as the North American Free Trade Agreement (NAFTA) and the Transpacific Trade Agreement, the dust has not settled. The question for many is how long will the standoff last, and what impact will all of this have on California’s thriving agricultural industry? 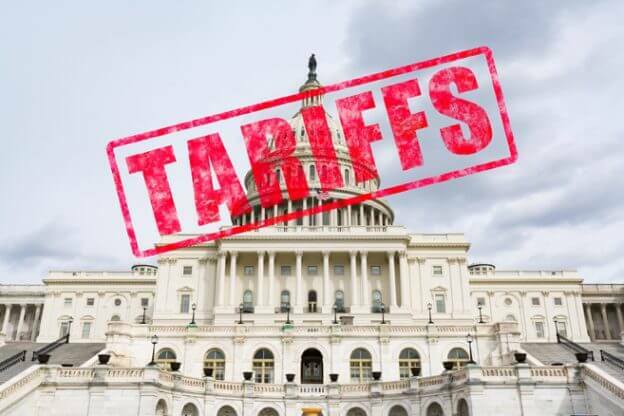 A recent Brookings Institute report, prepared by Mark Muro, Jacob Whiton and Robert Maxim, (source: Brookings analysis of OCEW and EMSi data), estimated the potential impact on employment in industries targeted for proposed tariff changes. Within the corn growing sector, for example, 18,000 jobs in the U.S. could be affected; for soybeans 5,000 jobs; fruit and nut production 187,000 workers, wineries 60,000 jobs, and distilleries 12,000 positions, for examples. A significant number of these products for export and associated jobs are in the western U.S., with heavy clusters of Ag producers located in states bordering the Pacific coast. Stone said compromises are needed to return us to a place where there is responsible free trade — where people all play by the rules. Second, he says a lot of Ag products are of high quality and premium priced, so while a small tariff increase could hurt a modest-sized steel mill, it would not hurt Ag as much, since the world appreciates the quality we deliver (and is willing to pay for it). The quest for second and third sources of selected imports continues among some nations as a hedge against fluctuating prices, tariff restraints and a consistent supply. California is also the source of 90% of the North America’s wine exports, as well as processed tomatoes, avocados, carrots, broccoli and celery produced in the U.S. In addition, California’s berries, peaches, nectarines, apricots, melons, oranges, lemons, tangerines, mandarins, spinach, lettuce, seasonal vegetables and rice constitute more than half of these categories of U.S. commodity exports. “Any time you make it harder to sell goods produced in the U.S. it is not a good for the marketplace as a whole,” said John Balletto, who together with his wife, Terri, own Balletto Vineyards and Winery. Balletto knows the produce business as well as wine, having started to grow vegetables at the age of 17 back in 1977. 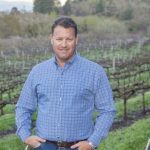 Working with his mother, Hazel, he built an enterprise that would become the largest produce grower north of San Francisco, years before getting into the wine business. While not currently exporting his family of wines, Balletto keeps an eye on changing international conditions. “The U.S. trade imbalance has gone on for too many years. My wish is that pending negotiations will rebalance the scales,” he said. Are Cal Ag Products at Greater Risk In a Worldwide Trade Controversy? 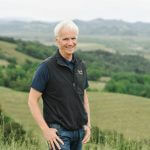 Some say California’s farmers and ranchers could be at much higher risk than those in other states, since Cal leads the nation in Ag income, and also because ranchers and farmers here are twice as dependent on foreign trade as those across the nation as a whole – as reported Los Angeles Times articles by Geoffrey Mohan and Michael Robinson Chavez in February and March. According to the USDA, California’s Ag industry with its 76,700 farms, had sales valued at $46 billion in 2016. Economists believe a number of these farms could experience collateral damage resulting from a global trade feud. Chief among the potential casualties could be higher tariffs on dairy, produce, livestock, and even hay. In 2016, California earned an estimated $20.04 billion from foreign trade in produce, meat, feed, seed and other commodities – including the state’s Ag revenue leader group (milk and cream) with over $6 billion in cash receipts. Total exports amount to about 44% of overall revenue. “A lot of people believe the U.S. is giving its products away and that the government should strive for equity when it comes to trade terms,” Doug Beretta said. He said today a lot of U.S. powdered milk and milk products go to China, because they cannot produce enough to fulfill domestic demand, despite a strong rise in the number of dairy farms and herds in recent years. However, U.S. experts say the output per dairy cow in China is half that of an American cow. Alfalfa, native to Southeast Asia, is another major U.S. export from Washington and Oregon. A trade conflict could drive alfalfa prices down. If the U.S. dollar becomes too expensive, American growers could be affected. American Ag is a major factor helping to alleviate trade deficits, by amassing a $5-billion trade surplus with the world led by products such as soybeans, grains, dairy, meat, fish, forest products, nuts, hay, fruit and vegetables, the USDA says. The USDA also revealed that farmers and ranchers nationwide have seen double-digit growth among many of these commodities since the mid-1990s. China, Mexico and Canada are among California Ag’s best customers – but they are also among a group of nations most responsible for the overall U.S. trade deficit. In response to heightened U.S. tariffs proposed on steel and aluminum, China’s reprisal announcement at the beginning of April contained a list of higher tariffs on 106 U.S. products, including soybeans, wheat, corn, beef, orange juice, sorghum, cotton and whiskey. However, China is not among the top 10 steel importers to the U.S. – but Canada and Brazil are. China announced that dozens of farm products — including soybeans and beef –will have and additional 25% tariff if the U.S follows through with 25% duties of its own on hundreds of Chinese goods as part of the Trump administration’s effort to force Beijing to change China’s unfair trade practices, along with policies that “coerce” American companies to transfer technology and intellectual property to Chinese firms. President Trump quickly retaliated with a list of 1,300 Chinese goods being considered for higher customs import tariffs, including products used for robotics, information technology, communications technology and aerospace. If levied, these tariffs could be applied to between $50 and $60 billion of Chinese imports per year. Beijing came back saying it will impose duties on $3 billion more of U.S. exports, such as pork, fresh and dried fruit, and wine. The President countered with a directive to the Office of the U.S. Trade Representative to consider $100 million in additional tariffs – continuing to exacerbate the controversy. However, none of these proposed tariffs are cast in stone, and there are signs from Beijing that there is a possibility of concessions on some items on the U.S. list of trade complaints. The U.S. proposals are subject to a public comment period, so the lists from both countries could shrink or grow, according to a MoneyWatch report on April 10. In terms of being able to get U.S. produce and commodities into China, Economist Dan Sumner, director of the Agricultural Issues Center at U.C. Davis, said, most U.S. products are channeled through duty-free Hong Kong, and can get into China through various forms of “leakage.” This indirect step can include shipments to Vietnam, for example, a nation that shares a “porous” border with China. According to Sumner, exporting U.S. wine to China’s 1.4 billion consumers is a long-term play. He said the Chinese diet is becoming westernized and this nation is a big growth opportunity for the future. For example, Chile has become a major second wine source. There are more than 70 wineries in Chile that export wine, and over 60% of Chile’s total annual wine output is exported to more than 150 countries. Turning to the President Trump’s use of strong trade language, Sumner said, “bluster” statements can have a major affect on futures and commodities markets, as well as buyers’ decision-making processes. After the initial U.S. tariffs were announced, the stock market fell 400 points.